Not my very best comet image, but given it was taken from the city looking directly into the light pollution it didn't turn out too badly. For other comet images please visit my comet page. Processing Calibration done in Images Plus without darks using the hot / cold pixel correction capability of the software. 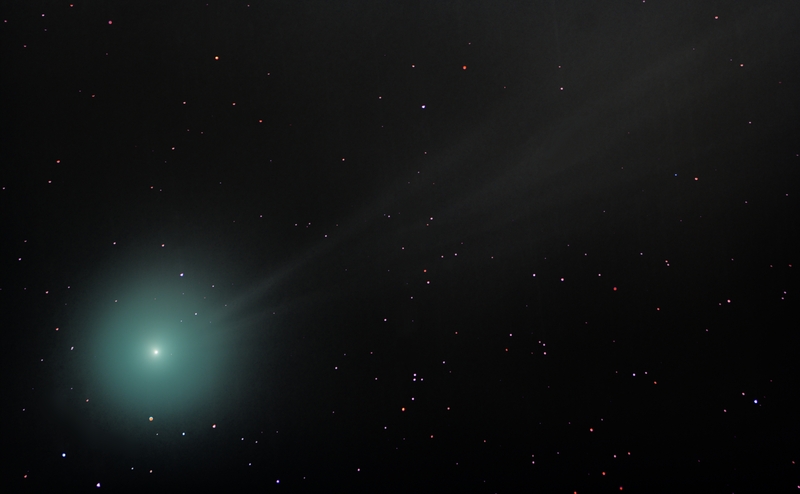 The image was then stacked twice, once using a median combine stacked on the comet and the second time using the standard auto processing with a median combine. The first stack suppresses the stars and the second the comet. Next, the comet only image was stretched using a masked stretching technique to bring out the tail from the light pollution. Next the feature mask was used to completely remove the comet from the star image. Finally the two images were recombined using a lighten blend mode with the star layer on the top of the stack.